Brian, most Australians save for their retirement through our mandatory superannuation system. Do you think this will be enough? Obviously what people want for their retirement will vary from person to person. It depends on your age, the type of lifestyle you want and the wealth you have inside and outside of super. The super system only started in 1992 at relatively low contribution levels so many older workers may have low balances which possibly won’t be enough to completely fund their retirement. However, all things being equal, younger generations should arguably be in a better position to self-fund retirement at the current super guarantee rate of 9.5% which is set to rise to 12% by 2025. But the sooner they start planning, the better. I don’t think people should be focusing solely on their super balance. Instead I think the real question is, what lifestyle do you want? Look at your total wealth, including assets outside of super and your eligibility for the Age Pension. For people with modest balances that don’t have a lot of assets outside of super the Age Pension remains an important pillar in the retirement system. And for younger people who have time on their side, the earlier they start engaging with their super, the better the outcome they could have. So what’s a good rule of thumb for how much people will need to spend in retirement? We often tell clients that, in our view, there are three broad stages of retirement, and you’ll typically spend differently during each stage. Firstly there’s the active stage when you first retire and you spend more because you might be renovating your house, taking holidays and being active in your hobbies. But then you settle into a simpler lifestyle where your costs are usually less. And finally you have a supported lifestyle where your expenses support your health and assisted living. Life expectancy for women is 88 and men 85.5 How does this help people understand how much super they’ll need, and how much income they can take each year in retirement? People want to have a stable level of income in retirement, so being able to estimate life expectancy is really important. In the 1980s life expectancy at retirement was to about 74 years, but now, if you’re a male it’s 85 and 88 if you’re female. If you’re a couple, there’s a 33% chance that one of you will live to age 94.5 And it’s really important to recognise that 50% of people live longer than these averages.5 So while statistics are a good starting point, you can’t assume that they will necessarily transpire in your own individual circumstance. The challenge that we have as a nation is that the vast majority of our retirement funds tend to be in account based pension products, meaning you have to estimate how much you can take out each year, while ensuring you have enough to last a lifetime. So planning becomes critical. There is also a lot of discussion at the moment on the role annuities and other longevity products play in providing income for people who expect to have long healthy lives. A lot of people lost large amounts of their retirement savings when the global financial crisis hit 10 years ago. What advice can you give people who are planning on retiring in the next few years, to attempt to mitigate the risk of a large market fall? It’s important to keep the majority of your retirement savings invested in a diversified portfolio, as a significant amount of the income you earn in retirement is produced by your saving balance at retirement. However, a fall in the value of your super around the time of retirement is, understandably, a retiree’s biggest fear – you’re not contributing anymore and you’re having to take out money at the bottom of the market, forcing you to potentially crystallise losses. Between 55 and 75 years, when your super balance is typically at its highest, it’s particularly important to try to mitigate this risk and the financial services industry is working hard to assist retirees with this problem. From an investment perspective there are a few solutions that are helpful in managing this risk. Bucket strategies aim to keep people invested when the market goes through a difficult time by having a portion of their money allocated to cash. There are products that have the flexibility to adapt asset allocation as needed. This means your clients’ investments are continually positioned to attempt to manage the risk of large losses and attempt to deliver real returns in a range of market conditions. Plus, there are products that provide a level of protection for a fee from negative returns or provide you with a stable level of income. It’s important that investors work with their adviser who can tailor these investment solutions to meet the client’s specific goals. So it’s best to talk to your adviser if you’re worried about this risk. Is there a single product that Australians can invest in once they retire, that will help to manage these risks you’ve talked about? That’s a good question, but the short answer is no. 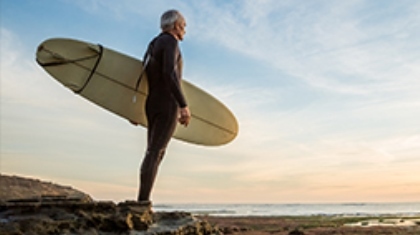 As we’ve discussed, everyone has different expectations about their retirement and different views on the amount of risk they’re prepared to take, so there’s no silver bullet. The industry is working hard to develop more longevity products (products that will give you an income for life) and better account based pensions, but I think retirement is a lot more complex and it’s likely we’ll see it’s a combination of products that are needed to meet people’s needs. 1. ‘ASFA retirement standard’, June quarter 2017. Based on figures for couples and single female retirees aged 65-85. 2. ‘MLC quarterly Australian wealth behaviour survey’, MLC, Q1 2107. 3. The OECD for example suggests a replacement rate for a median income earner of 70% of final earnings. ‘OECD private pension outlook’, 2009. 4. ‘ASFA retirement standard’, June quarter 2017. 5. ‘Australian life tables 2013 – 2015’, ABS. The value of an investment may rise or fall with changes in the market.